Create fiendishly fun TINYAVR microcontroller projects. This wickedly inventive guide shows you how to conceptualize, build, and program 34 tinyAVR microcontroller devices that you can use for either entertainment or practical purposes. 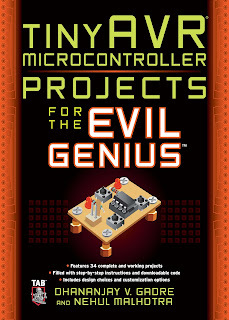 After covering the development process, tools, and power supply sources, tinyAVR Microcontroller Projects for the Evil Genius gets you working on exciting LED, graphics LCD, sensor, audio, and alternate energy projects. Esta guía de malvada inventiva muestra cómo conceptualizar, construir, y un programa de 34 microcontroladores tinyAVR que se pueden utilizar ya sea para entretenimiento o con fines prácticos. Después de cubrir el proceso de desarrollo, herramientas y fuentes de alimentación, proyectos tinyAVR microcontroladores para el genio malvado se está trabajando en la apasionante LED, LCD gráfico, sensores, audio, y los proyectos de energía alternativa. Tour de Tiny. About the Book. Atmel’s tinyAVR Microcontrollers. tinyAVR Devices. tinyAVR Architecture. Elements of a Project. Power Sources. Hardware Development Tools. Software Development. Making Your Own PCB. Hello World! of Microcontrollers. LED Projects. LEDs. Types of LEDs. Controlling LEDs. Flickering LED Candle. RGB LED Color Mixer. Random Color and Music Generator. LED Pen. Advanced LED Projects. Multiplexing LEDs. Charlieplexing. Mood Lamp. VU Meter with 20 LEDs. Voltmeter. Celsius and Fahrenheit Thermometer. Autoranging Frequency Counter. Geek Clock. RGB Dice. RGB Tic-Tac-Toe. Graphics LCD Projects. Principle of Operation. Nokia 3310 GLCD. Temperature Plotter. Tengu on Graphics Display. Game of Life. Tic-Tac-Toe. Zany Clock. Rise and Shine Bell. Sensor Projects. LED as a Sensor. Thermistor. LDR. Inductor as Magnetic Field Sensor. LED as a Sensor and Indicator. Valentine’s Heart LED Display with Proximity Sensor. Electronic Fire-free Matchstick. Spinning LED Top with Message Display. Contactless Tachometer. Inductive Loop-based Car Detector and Counter. Electronic Birthday Blowout Candles. Fridge Alarm. Audio Projects. Tone Player. Fridge Alarm Redux. RTTTL Player. Musical Toy. Alternate Energy Projects. Choosing the Right Voltage Regulator. Building the Faraday Generator. Experimental Results and Discussion. Batteryless Infrared Remote. Batteryless Electronic Dice. Batteryless Persistence-of-Vision Toy. C Programming for AVR Microcontrollers. Differences Between ANSI C and Embedded C. Data Types and Operators. Efficient Management of I/O Ports. A Few Important Header Files. Functions. Interrupt Handling. Arrays. More C Utilities. Designing and Fabricating PCBs. EAGLE Light Edition. EAGLE Windows. EAGLE Tutorial. Adding New Libraries. Placing the Components and Routing. Roland Modela MDX-20 PCB Milling Machine. Illuminated LED Eye Loupe. Version 2 of the Illuminated LED Eye Loupe. Version 3 of the Illuminated LED Eye Loupe.